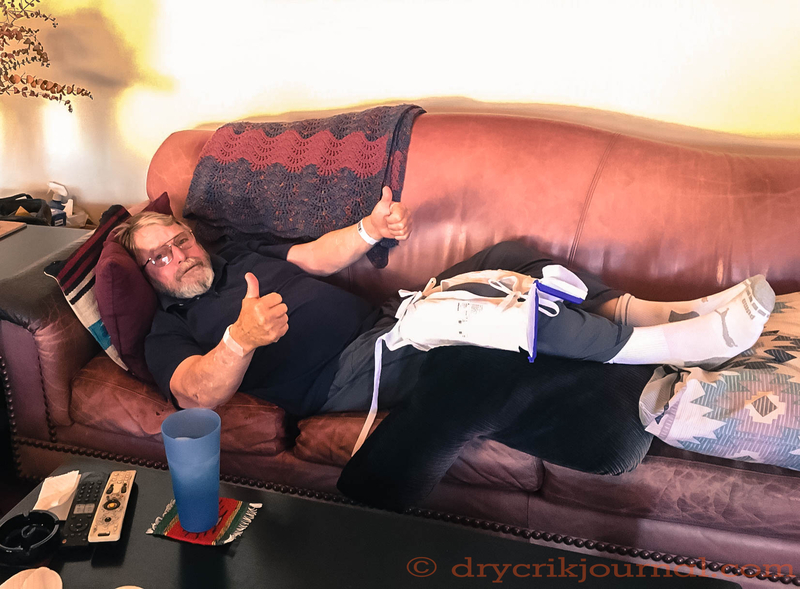 Last Friday, I underwent knee replacement surgery. I was able to walk with a walker by Saturday. Rehabilitation will undoubtedly be slow and posts to the blog may be less frequent. This entry was posted in Photographs, Ranch Journal and tagged Dry Creek, photography. Bookmark the permalink. Wishing you a quick and problem-free recovery, John! Hope you get your giddy-up back quick. Take care, John. That couch looks mighty comfy, John, and it looks as if you’ve got a tall cool one handy, along with the remote, so you appear to be as well fixed as possible to get through this. Hope the new knee works great. Good luck with rehab! Too early in the day for more than ice water in the tall one, my glazed eyes: prescription drugs. Hope all goes well and quickly in the healing process, John. My husband had a hip replacement a number of years ago and loved the results. I’ve been dealing with the old knee far too long. I’m determined to make the new one as successful as possible. We wish you a speedy recovery!! Thanks, neighbors. I think I’m doing fine. Must have had different surgeons. Mine still hurts. Speedy recovery. Continued success with your recovery.